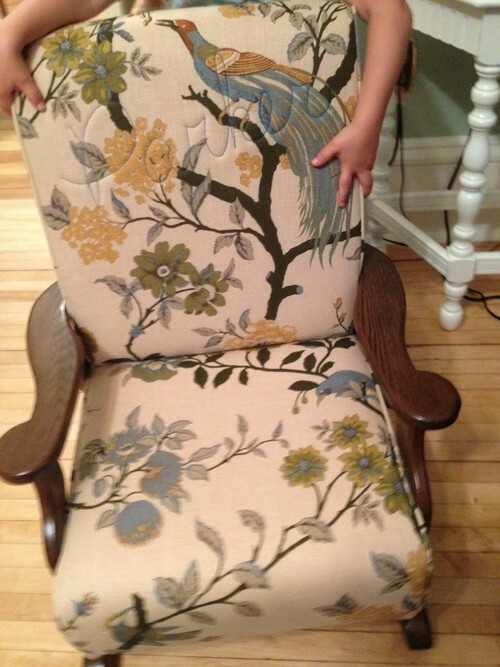 A few weeks ago when Kevin, the upholster who refinished and reupholstered Shon’s great-great aunt Frieda’s parlor furniture AND built our ottoman, delivered the ottoman, he asked me if I had any extra fabric. I said I would know as soon as I was finished making the curtains. A few weeks later he texted to see if I had extra fabric for a “surprise.” I said that I didn’t but I could easily pick up some more – he asked for 1 yard. I was curious – “was Kevin making a pillow?” Then a few days later he asked me how to spell my name, Shon’s name and Parker’s name. My curiosity mounted. However, I had no idea, and could have never expected what an amazing surprise he had in store for us. 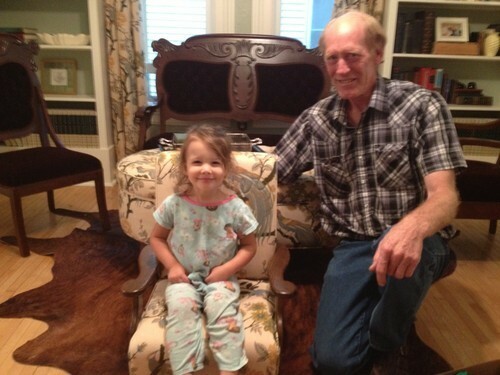 Saturday night Kevin and his wife, Deb, stopped over with this beautiful rocker he built and upholstered just for Parker! It is truly an heirloom piece! Kevin’s gift is one of several we’ve been blessed with throughout this entire home remodel. Joe Meier our contractor – on his own time – used his paint sprayer to paint our kitchen cabinet doors, my dining room chairs and living room bookshelves for us. Joe painting these things for us is a HUGE deal. Not only does it look perfect – no drips – but with a toddler the only time I can paint is after Parker goes to bed at 7 – which, after getting up at 5 a.m. to work, makes for a really long day! I asked Dawn Bures, an interior designer I’ve met several times through home articles, if I could pay her for a few hours of her time to help me solve a few decorating dilemmas. She stopped over for a few hours Friday and totally transformed my living room – specifically she came up with the idea to put two trunks side-by-side to add substance. I originally had one long low trunk in running parallel to my couches. It was too far from either couch to serve a purpose and looked lonely. She pulled a second trunk that was sitting in storage behind my couch, and positioned both trunks perpendicular to the two couches. Using a few accessories I had, she united the two trunks. I really like her eye! She said we could do a trade out. I’m going to make curtains for her sometime. About a year ago Shon and I awoke to a loud crash. Shon ran downstairs but returned to bed saying he couldn’t figure out what made the noise. The next morning I walked through the parlor and noticed that this mirror had fallen off the wall and miraculously didn’t break! The mirror and vanity table once belonged to my Great Granny Mary. Shortly after we married, my Uncle Mark and Aunt Janet gifted them to us – they are beautiful and we love them. 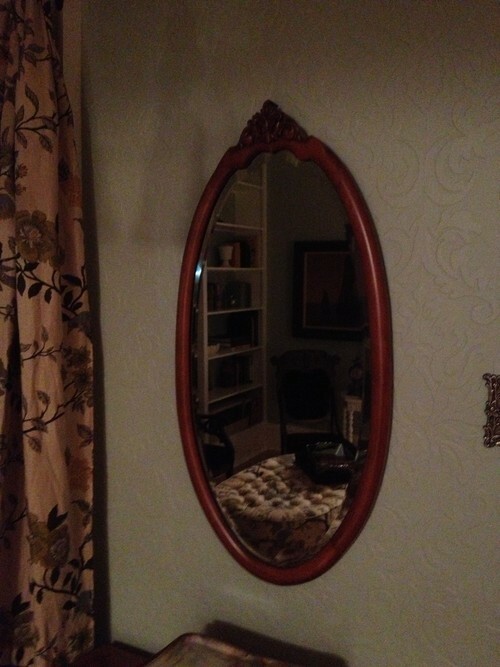 When Shon took a look, he said it wasn’t the hanger that gave out – we’d use the appropriate one for the weight of the mirror – it was the actual plaster that had fallen away. From that moment on I was scared to hang anything and quickly found a safe space to store this mirror. Fast forward a year and parlor remodel later. I thought to ask Joe Meier, our contractor if he knew of any fool-proof ways to hang heavy items on plaster walls. His suggestion was this toggle bolt. The same type used when hanging towel bars. Although this system is quite a commitment, due to the large hole that is needed for the entire apparatus to anchor securely through the plaster and lath, it is so reassuring to know we won’t wake up to another loud crash anytime soon. First drill a long hole through the plaster and lath. Make sure it is large enough for the “wings” to fit through. 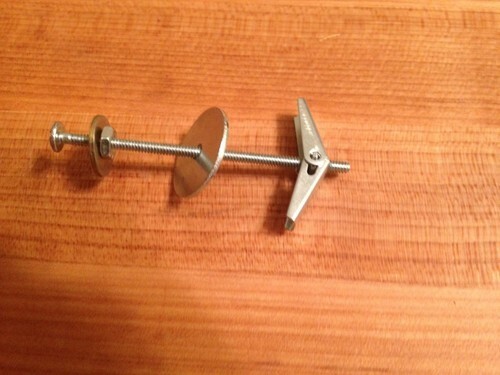 Then unscrew the wings, put a nut on then a washer large enough not to allow the screw or nut through the drilled hole. Then, carefully fold the wings over the bolt to ensure they go into the hole and don’t open until they are safely past the lath. 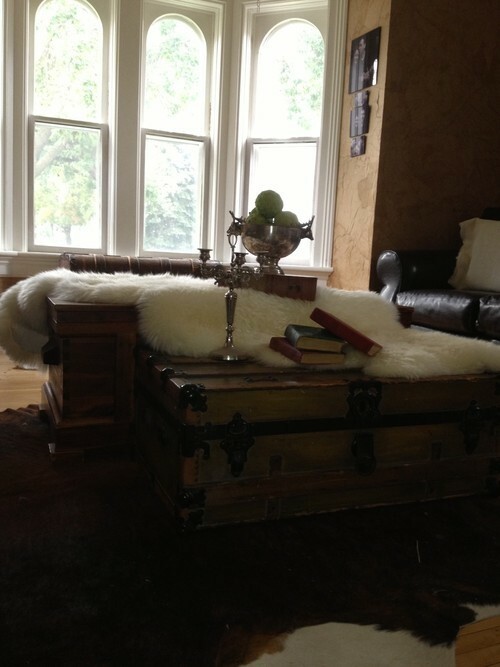 Once I set our new ottoman in the parlor, it really pulled the seating area together – but I decided it needed a tray of sorts so that people could set their drinks on it if they chose/and I’d seen several in decor magazines with trays and liked the look. 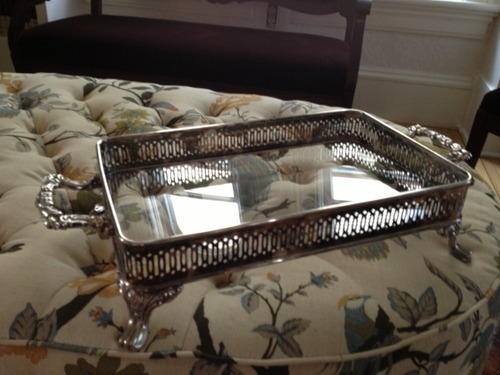 I had seen just the perfect tray just a week ago at St. Vincent De Paul Thrift Shop – an oval silver tray with a short lip. When I saw it I thought it was pretty, but didn’t need it so I didn’t purchase it. A week later when I went to buy it, of course it was gone. So, Parker and I decided to make a trek around the store to see if there were any other silver plated trays – what we found wasn’t a tray, but a silver serving dish to add pizzazz to a casserole dish. It was only $4, so I thought if my idea didn’t work, I’m not breaking the bank. I took it to ACE and they cut a piece of Plexy glass for only $3.88 to fit. Voila` a beautiful tray for $8!